The post-launch calibration was updated monthly. For the same radiance count of VIS and NIR bands, applying different calibration will result in different NDVI. Becasue the calibration parameters were manually entered into VHP system, it is better to check them before putting them into operation. The post-launch calibration parameters were saved in separate files monthly. 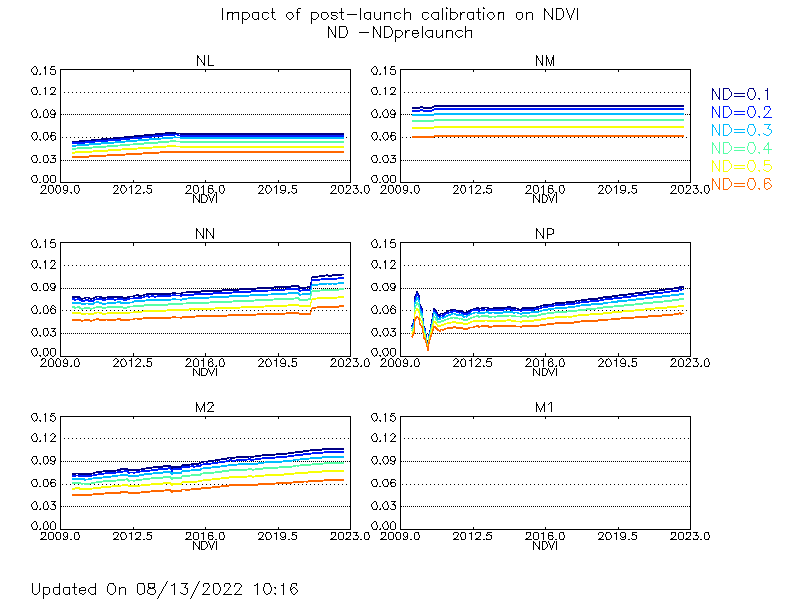 Beased on NDVI equation, the diffence of NDVI between with and without post-launch calibration applied can be calculated for a given pre-launch calibrated NDVI value. See picture below. The x-axis is the time the calibration parameters were obtained. This plot helps evaluate the impact of post-launch calibration change on NDVI without applying it to real AVHRR VIS/NIR channel data.